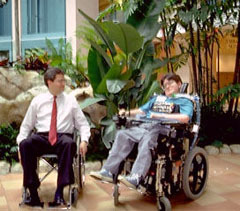 A general manager gets a "wheelchair view" of his facility while Paul Duke guides him through the finer points of navigation and access. Never has a training program received such high marks by our employees. Clyde E. Culp, Former President & CEO of Long John Silver's Restaurants, Inc. Finally I have a guest-service training video specifically for the hospitality field that is from the view point of customers having disabilities. Your Opening Doors program should be a basic training program for all hotels. Our employees, from housekeeping to managers, praised your practical approach. When the entire hotel staff is enthusiastic about a training program, then you have developed an innovative product! Hotel Manager, Renaissance Hotel, Washington, D.C. Your program is excellent and very much needed. Too often people do not think. Your program covers much of what needs to be said. Changing the way people think and treat others is an on-going process. Our programs are affordably priced so every location can have a DVD to train newly-hired personnel as soon as possible. Remember, a company is only as good as its weakest link. Besides being excellent customer service training programs, Opening Doors® offers a high level of risk management concerning potential ADA complaints. 40-minute training DVD divided into 4 ten-minute sections; leaders' activity book and training overheads on CD. Please contact us for bulk orders greater than 10 programs. One 40-minute training DVD divided into 4 ten-minute sections, and one 18-minute food service DVD; CD with leaders' activity books (one for lodging and one for food service), and training overheads. 18-minute training DVD divided into 4 sections; CD with leaders' activity book and training overheads. 48 minute training DVD divided into 4 twelve-minute sections. Topics cover lodging and food service. Prerequisite: Must purchase Limited or Full-Service Lodging DVD in English.